Issue Closed Right Share Notice of Meromicrofinance Laghubitta Bittiya Sanstha Ltd.
RTS notice of Trishuli Jal Vidhyut Company Limited. Invalid IPO List of Trishuli Jal Vidhyut Company Limited. 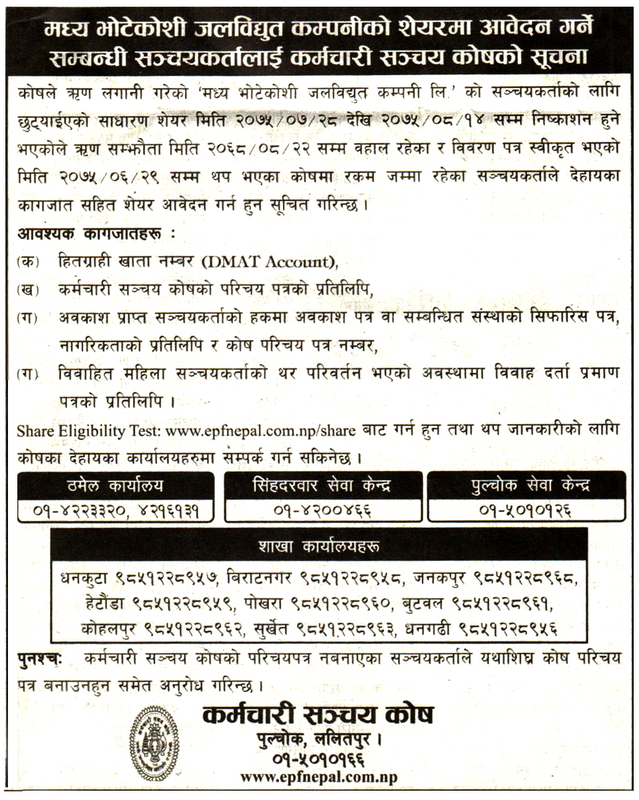 Notice Regarding Share Registrar of Nepal Bangladesh Bank Limited. Prospectus of Trishuli Jal Vidhyut Company Limited. 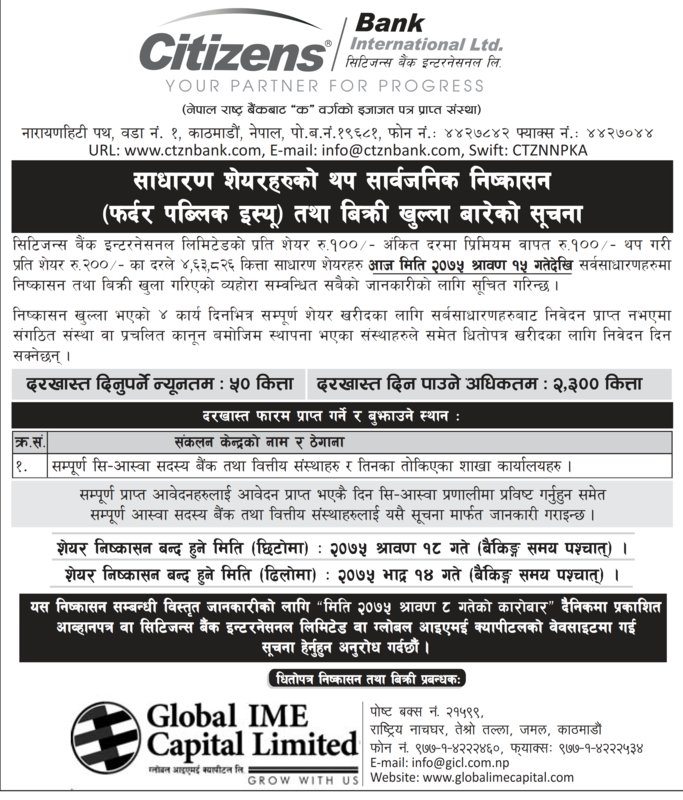 Notice Regarding BID Open OF IME General Insurance Limited. 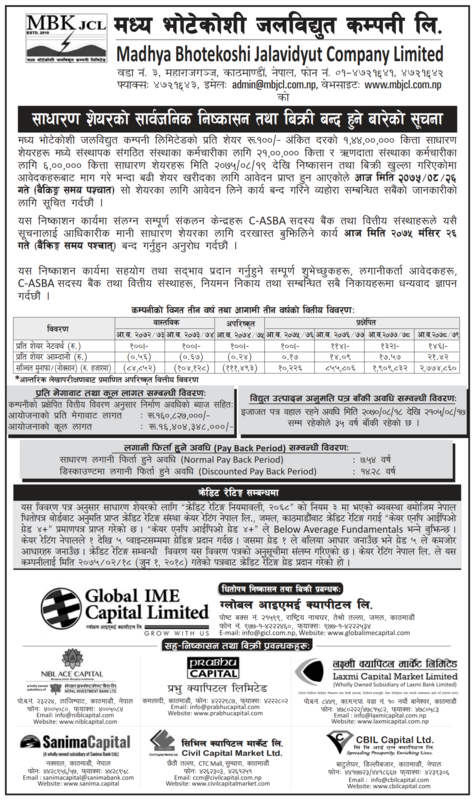 Issue Remainder Notice of Nepal Insurance Company Ltd.
Issue Open Right Share Notice of Nepal Insurance Company Ltd.
Issue Open Right Share Notice of Meromicrofinance Laghubitta Bittiya Sanstha Ltd.
Auction Notice of IME General Insurance Limited. Allotment and Refund Notice OF IME General Insurance Limited (10:8 right share). Right Share Notice of Meromicrofinance Laghubitta Bittiya Sanstha Ltd. 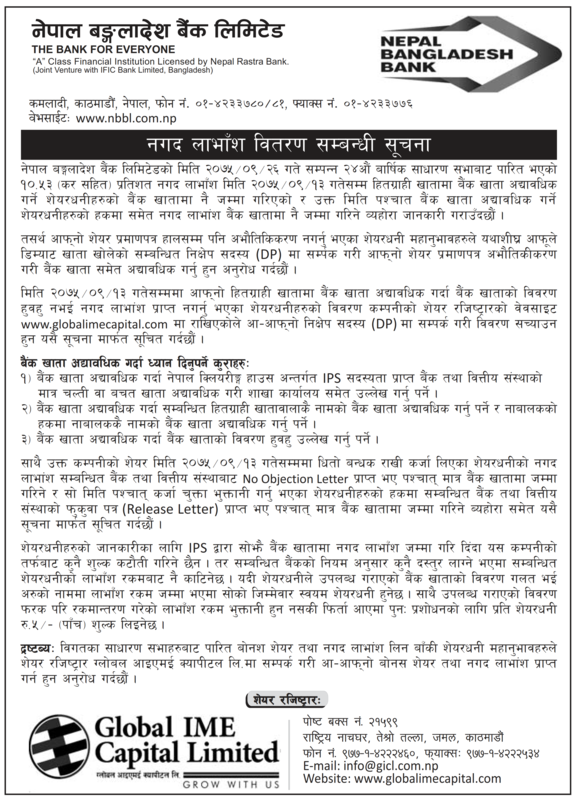 Announcement Letter for Right Share Issue of Nepal Insurance Company Ltd. Announcement Letter for Right Shareissue of Meromicrofinance Laghubitta Bittiya Sanstha Ltd. Right Share Closed Notice of IME General Insurance Limited. Cash Dividend Distribution Notice of Kanchan Development Bank Limited. 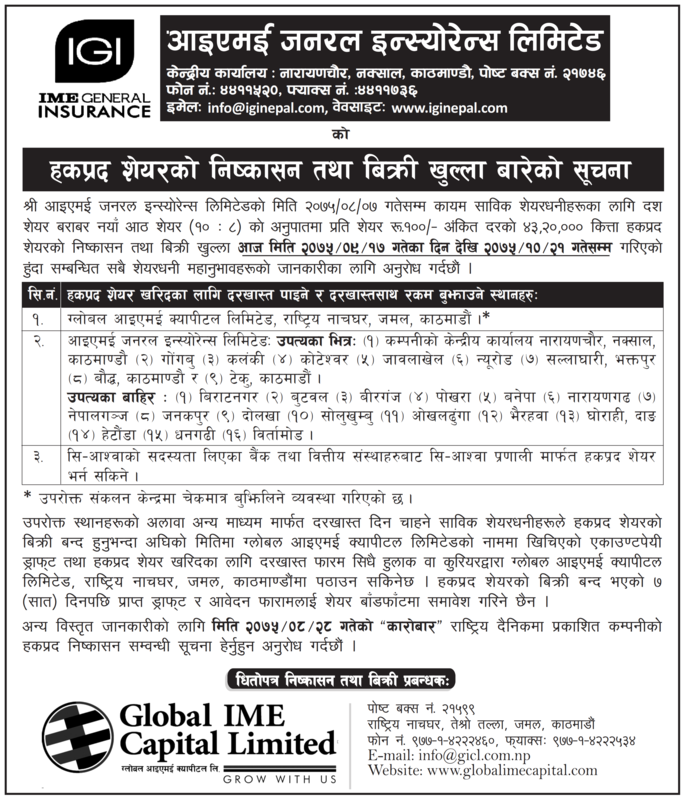 Right Share Notice of IME General Insurance Limited. 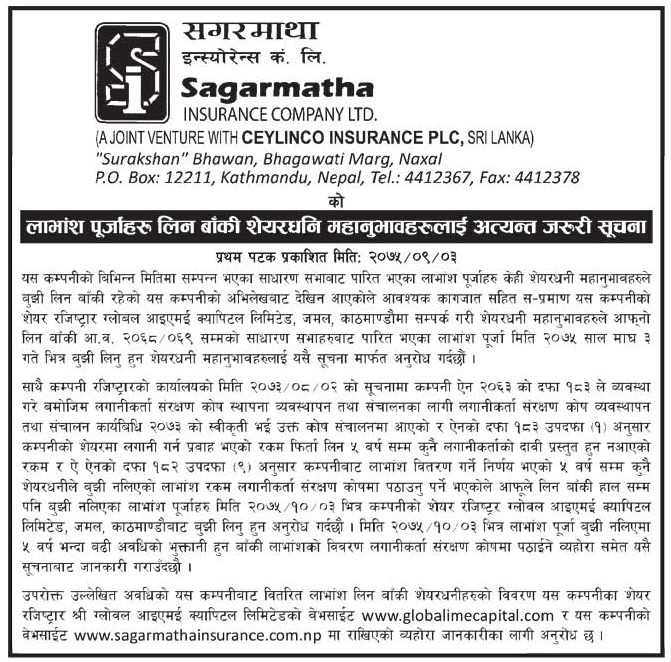 Notice For remaining shareholders to receive dividends of Sagarmatha Insurance Company Ltd.
2nd Stage Issue Closed Notice of Madhya Bhotekoshi Jalavidyut Company Ltd.
Information regarding 2nd stage issue of Madhya Bhotekoshi Jalavidyut Company Ltd.
Notice form Employee provident Fund on Madhay Bhotekoshi Jalavidyut Company Ltd. 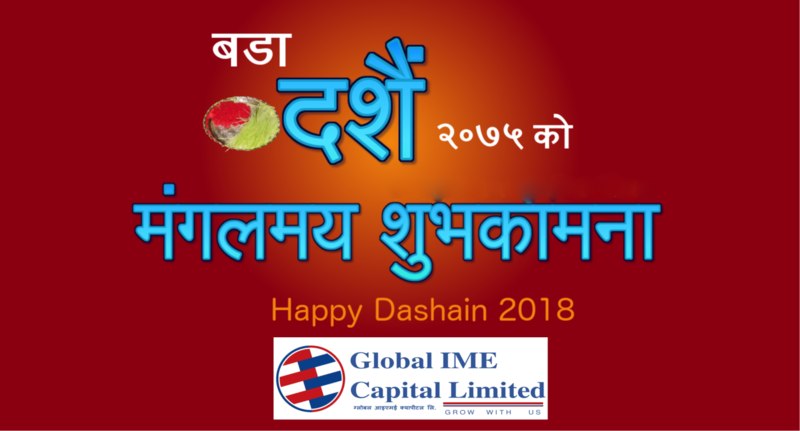 Prospectus of Madhya Bhotekoshi Jalavidyut Co. Ltd. Announcement Letter for IPO of Madhya Bhotekoshi Hydropower Company Ltd.
RTS of Kalika Power Company Ltd.
Press Release for IPO of Kalika Power Company Ltd.
Issue close notice of Kalika Power Company Ltd.
FPO Closure Notice of Citizens Bank International Ltd. Prospectus for FPO Citizens Bank International Ltd. Announcement Letter for FPO of Citizens Bank International Ltd.
Auction Open Notice of Best Finance Company Ltd.
Allotment Notice of First Microfinance Laghu Bitta Bittiya Sanstha Ltd.
Registrar to Share notice for Global IME Laghubitta Bittiya Sanstha Ltd.
First Microfinance Laghubitta Bittiya Sanstha Ltd.